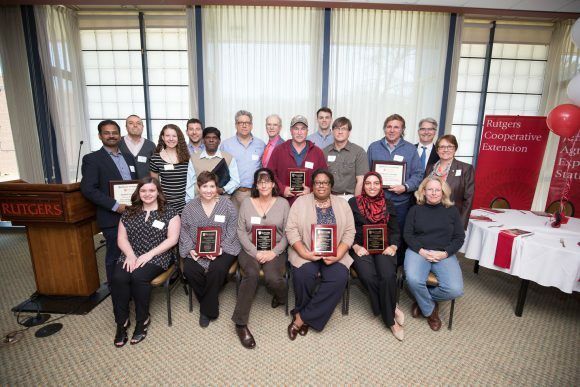 Share the post "A Celebration of Excellence 2018"
2018 Excellence Award Winners with dean Richard Ludescher. Photo: Christopher Flanegan. 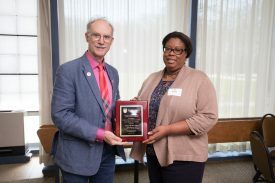 On April 23, faculty, staff and students attended the 25th annual Celebration of Excellence for the School of Environmental and Biological Sciences and the New Jersey Agricultural Experiment Station held at Neilson Dining Hall. According to executive dean Bob Goodman, this signature event acknowledges contributions that meet carefully-considered criteria, including creativity, original work and ideas, innovation, effectiveness, integrity, leadership, impact, community engagement and excellence. The awards were presented by dean of academic programs, Rick Ludescher. 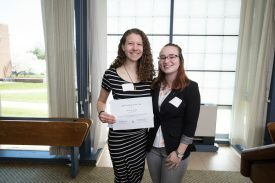 SEBS student Gabrielle DiIenno also presented the Alpha Zeta Honor Society Awards at the event. Following are the Excellence Award recipients along with excerpts from Ludescher’s presentation. Elisabeth Sikes, Department of Marine and Coastal Sciences. Photo: Christopher Flanegan. Liz loves the ocean. She probably visits the shore regularly. But more than that, she inspires undergraduates to not only appreciate and understand ocean chemistry but also to see its relevance in their own lives. She has actively developed and offered interdisciplinary science courses that illustrate the societal relevance of problematic issues such as ocean acidification and global climate change. She broadens our students’s perspectives by linking these social issues to fundamental processes such as biogeochemical cycling in marine ecosystems. 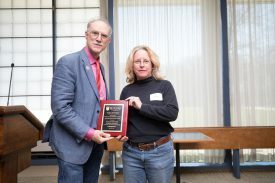 For nearly 10 years, Liz has been a key driver of the Rutgers Oceanography graduate program as chair of the Scholastic Review Committee, with primary responsibility for overseeing all Ph.D. qualifying exams and monitoring student progress to ensure timely completion of degree requirements. She has been a key lecturer in the Marine Science core courses at both the undergraduate and graduate levels, in which she receives overwhelmingly positive reviews. She leads her advisees to consistently find professional placement in addition to putting herself forward as a mentor to all our female students. For these achievements and more, we are pleased to present Liz Sikes with the 2018 Excellence in Teaching Award. Julie Lockwood, Department of Ecology, Evolution and Natural Resources. Photo: Christopher Flanegan. Julie Lockwood is fascinated by invasive species; she may even like invasive species. Or some of them anyway. She has studied them to the point that she is now one of the world’s leaders in her field of invasive species ecology. She has over 100 peer-reviewed publications and is currently the most-cited female scientist in her field in the world. But her work is not merely academic, not merely pedantic, not merely scientific. Since invasive species can have enormous socio-economic consequences, her work has direct and important implications for public policy and behavior. Julie explicitly recognizes this by engaging with stakeholders and government agencies to ensure that public policies and procedures are based on the best scientific knowledge. In her spare time, she also writes scientific textbooks as well as books for a more general audience. And finally, but perhaps most importantly, she is an outstanding mentor and graduate student advisor. It is thus my distinct pleasure to present Julie Lockwood with the 2018 Research Excellence Award. Cara Cuite, Department of Human Ecology. Photo: Christopher Flanegan. Cara is the very model of a modern Rutgers extension specialist. One who actively engages our local urban community in all aspects of her diverse projects. Her partnership with the New Brunswick Community Food Alliance exemplifies her approach. At the Alliance Cara and colleagues directly involved the New Brunswick community in the design, analysis and reporting of the Community Food Assessment and Community Food System Action Plan and continues outreach on this project with community groups throughout the city. But her outreach influence extends well beyond the confines of New Brunswick. Her research on social perceptions of genetically modified foods has led to significant outreach efforts across the entire country, and led to an invitation to give the keynote address at a national Extension conference. And her important work on coastal storm risk communication has been shared with emergency managers across New Jersey and featured in numerous national publications, including the New York Times, and she has authored an opinion piece for the Washington Post. For her important extension outreach for the common good, we are pleased to present Cara Cuite with a 2018 Outreach Excellence Award. 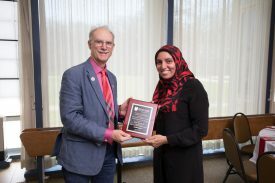 Sara Elnakib, Department of Family and Community Health Sciences. Photo: Christopher Flanegan. Paterson Public Schools is a low-income urban district mandated to provide free breakfast and lunch to all students under the Community Eligibility Provision of The Healthy Hunger-Free Kids Act. Implementation of this mandate, however, led to a large amount of food waste and consequently extra expense. Sara addressed this issue by educating all 210 foodservice workers in the district in the principles of the Smarter Lunchroom Movement, a national effort that provides the knowledge and resources needed to build a lunchroom that makes healthy food choices the easy choice. Her efforts made lunchroom food offerings more appealing, directly leading to a 14% reduction in food waste, with nearly half of the food saved consisting of fruits and vegetables. Meaning, of course, that students were eating more fruits and vegetables. Additionally, by creating a policy to allow donations of unopened packaged foods, the district was able to donate over 7,000 pounds of food in seven months to a local food pantry. 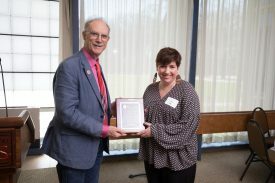 We thus recognize Sara’s ability to create system-wide change at the Patterson School District by presenting her with the 2018 Outreach Excellence Award. Daniel Hoffman, Department of Nutritional Sciences. Photo: Christopher Flanegan. Dan likes to travel. He especially likes to travel to foreign countries. He combines this penchant with his considerable expertise in human nutrition to make a significant impact in the international arena. 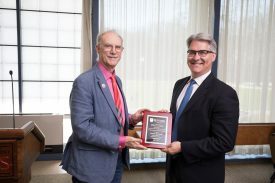 He has established a highly regarded research program focusing on child growth in developing and transitional countries, a program particularly focused on Brazil, as well as Kenya and Mexico. He has numerous important peer-reviewed publications based on this research, has given many invited talks in the U.S. and abroad, has provided international research and study experiences to both undergraduate and graduate students, and was recently awarded visiting professorships at two Brazilian universities. Dan takes every opportunity to help students create a knowledge and experience base that will enable them to grasp how nutritional science interacts with economics and politics to affect the entire nutritional health spectrum from nutrient deficiencies to obesity. The service learning component of his study abroad program has given students invaluable opportunities to witness the factors affecting undernourished children living in shantytowns worldwide. For his extensive and important international efforts, we are delighted to present Dan with the 2018 International Excellence Award. Richard DeStefano, Marucci Blueberry-Cranberry Research Center. Photo: Christopher Flanegan. Rich has been the Marucci Center Farm Supervisor for 26 years. During this time he has juggled the needs of seven research programs with great skill. The Marucci Center is frequently challenged with power outages and flooding; although these can occur at any hour both winter and summer, throughout Rich’s tenure there has not been a significant loss of plant material in greenhouse or field. Rich clearly does not sleep some nights, remaining dedicated to the Center’s welfare 24/7/365. 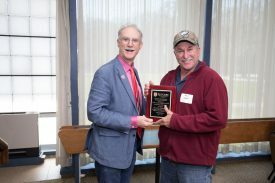 He exhibits exceptional resourcefulness and creativity in his ability to fix or fabricate just about anything, and regularly contributes to a positive, collaborative work environment, always coming to Farm Meetings with a good attitude, and always ready to juggle the many requests while good naturedly working out what and when is possible. For his dedication, his enormous competence, and his easy-going personality that helps build community, we are pleased to present Rich with a 2018 Staff Excellence Award. Gail McKenzie, Department of Landscape Architecture. Photo: Christopher Flanegan. The mission of the Department of Landscape Architecture is to provide leadership in the design and stewardship of the environment. 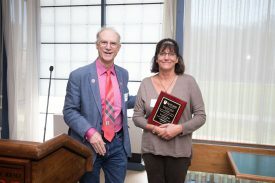 Gail provides superior sustained service to this mission through her exceptional administrative support to the department’s undergraduate and graduate programs. Her expert support for incoming faculty and her sure supervision of student employees are examples of the unparalleled excellence she displays in the performance of her duties and responsibilities. Gail’s extensive institutional knowledge and willingness to reach out to other groups throughout SEBS and Rutgers combined with innate resourcefulness, innovation, and creativity help her solve just about any problem occurring in the lives of our students and faculty. The department wholeheartedly acknowledges the leading role she plays in generating a positive, collaborative work environment and we are equally delighted to present Gail with a 2018 Staff Excellence Award. The Ethnic Produce Production and Marketing Working Group won the Team Excellence Award. Photo: Christopher Flanegan. Evolving from a call to address the “Nuances of Marketing Ethnic Produce” for the Mid-Atlantic Direct Marketing Conference in the late 1990’s, an Ethnic Produce Production and Marketing Working Group was established at Rutgers to identify and quantify opportunities and barriers to the adoption of ethnic crops as alternatives for East Coast farmers. Over the last two decades, the Working Group has secured more than $2.3 million in external funding to conduct research and implement outreach programs relating to ethnic produce. Individually and as a team, this diverse group of researchers and extension personnel have published 74 refereed journal articles on ethnic produce alone. 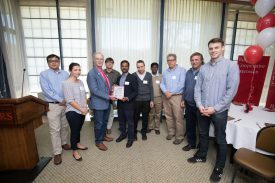 They have also generated 14 extension publications, 14 peer-reviewed abstracts, four conference proceedings, five edited books, 17 edited book chapters, 90 presentations, 14 posters, 20 abstracts in proceedings, 4 trade journal articles, 17 newsletter articles, and one new Rutgers plant variety release. In 2012, the Working Group received the Northeast Extension Directors’ Award of Excellence. We are equally honored to present the Ethnic Produce Production and Marketing Working Group with the 2018 Team Excellence Award. 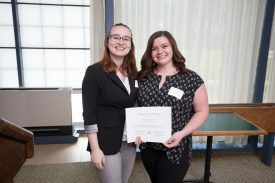 Alpha Zeta Honor Society Member Gabrielle DiIenno. Photo: Christopher Flanegan. There are many reasons to be proud of the long history and traditions of excellence at the School and the Experiment Station. The honors and service Fraternity of Alpha Zeta is one of these reasons. The George H. Cook chapter was founded in 1922, in only the second year of the New Jersey College of Agriculture. Since then, the brothers of the Fraternity of Alpha Zeta, for many years now including women as well as men, have represented the best and the brightest examples of what it means to be a successful and involved undergraduate at our School. 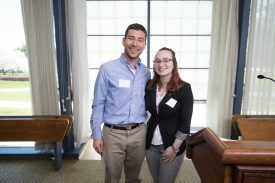 Each year students in Alpha Zeta honor select individuals for their contributions to our academic community. 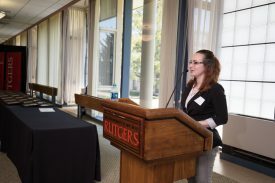 This year’s winners were introduced by Gabrielle DiIenno, and included: Kayla Luis, Freshman Award (who could not be in attendance to accept the award); Katherine Fafara, Sophomore Award; Samuel Snyder, Junior Award; and Adrienne Sherman, Senior Award. 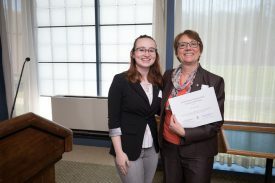 Gabrielle DiIenno with Jill Lipoti, Department of Human Ecology and winner of the Barbara Munson Goff Teacher of the Year Award. Photo: Christopher Flanegan. Alpha Zeta Student of the Year award winner Katherine Farfara, class of 2020. Photo: Christopher Flanegan. Alpha Zeta Student of the Year award winner Samuel Snyder Class of 2019. Photo: Christopher Flanegan. Alpha Zeta Student of the Year Award winner Adrienne Sherman, Class of 2018. Photo: Christopher Flanegan.